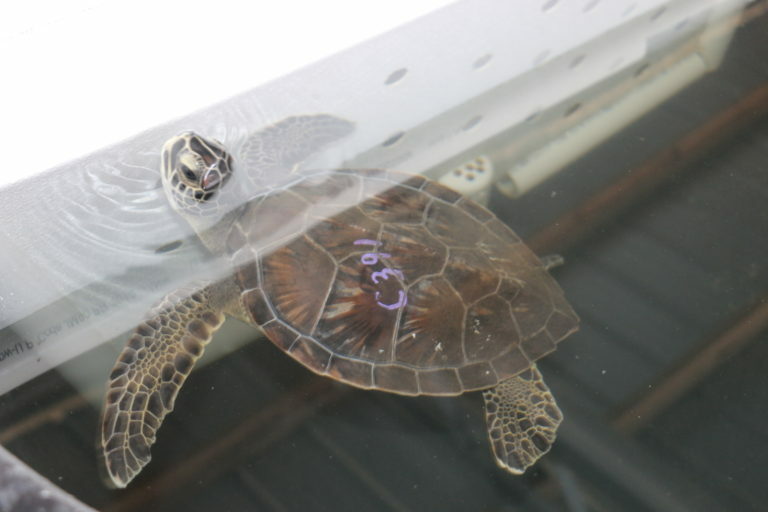 Michael, a green sea turtle was released into the Gulf of Mexico at Cape Palms Park at Cape San Blas at 9:30 am central/ 10:30 am eastern on Friday, May 4th. Part of a much larger event, the sea turtle stranded early in January 2018 during the second largest cold-stun event in the Florida Panhandle. During two cold snaps in early January, approximately 1,200 sea turtles were cold stunned in Saint Joe Bay, Florida and surrounding bays and estuaries. Most of the sea turtles that stranded during this event were otherwise fit and were released into the Gulf of Mexico as soon as their body temperatures were stabilized. However, Michael and approximately 30 others were kept behind for various reasons. In addition to being cold stunned, Michael was malnourished and had small wounds on his body. The animal was tube fed at first and given antibiotics. Michael gained weight and began to forage and dive successfully. The sea turtle was medically cleared for release.